So I have posted a few things in the New Members forum as well as on a few other threads. I decided to start my own thread that will detail my trials and tribulations with my newly acquired 2003 S.
I found the car on CL in Santa Cruz. Seller was very cool. 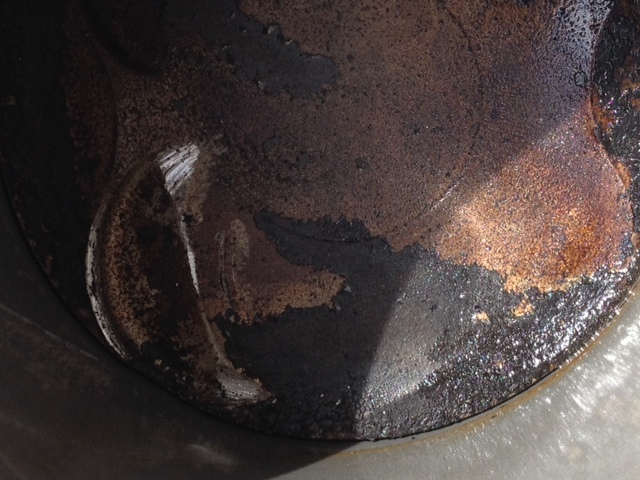 Said it had zero compression in #5, no inter mix and no metal in oil. He had recently replace the water pump, alternator, RMS, IMS w/LN ceramic unit, had the tip trans fully serviced, new axle boots, new rotors, pads, etc...I got the car for a very good price. (see Found on CL thread) The seller was really great, open and honest. My Father-in-law has a shop locally and thankfully allows me to use his facility. I have some experience with wrenching, but its just a hobby. (see New member intro for my other projects). I am a middle school teacher and father of a very busy HS junior. She plays water polo and is an accomplished violinist. My hobby time is very limited. Originally I was going to try and address the issue of cylinder #5 in car. I scoped the hole (couldn't really see much) and ran my own compression tests. #5 was indeed not pumping up. 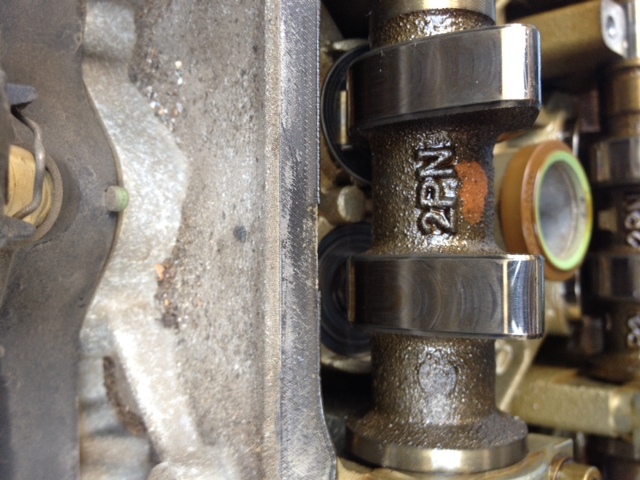 I pulled the exhaust manifold and could see the exhaust valves in their seats. 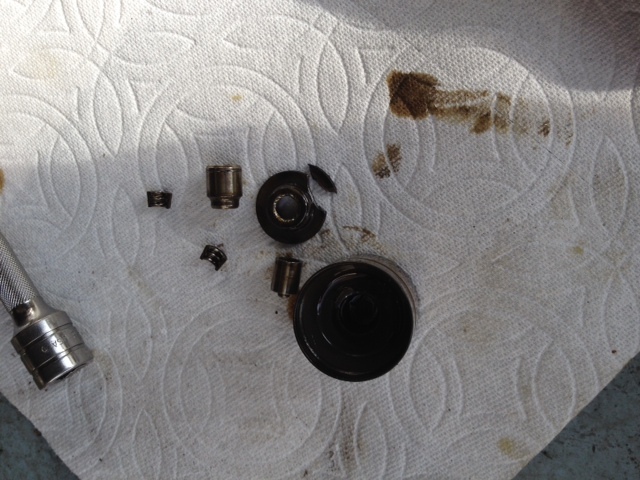 The problem had to be with an intake valve..top of the head, hard to reach. Because I was not even getting a bump on the needle during the compression test, I figured that one of the intake valves must be hung open. It was at that time I decided to drop the motor. 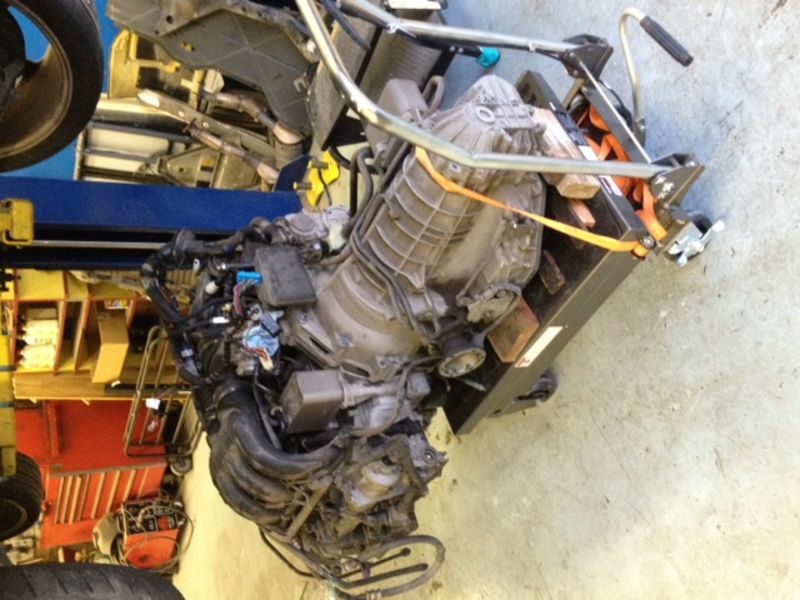 Because of my access to the luxuries of a repair shop, I was able to drop motor and trans together. Lots of great resources on this forum as well as books made a very intimidating job manageable. ...now its easier to see the deflated lifter. Next came the cam cradle/lifter guide.....and what I was able to see with that out of the way. Pulling the spring out of the way...a little damage. Not bad. The lifter did not want to come out the way the others did. I tried a magnet wrapped in a shop cloth and that didn't work. However, once I had the cradle off the stem, i was able to easily push it out. Must have been hung up on the stem by some of the shrapnel? I tugged on the stem a little to see if it was able to slide in the guide....but nope. So, the head needed to come off. 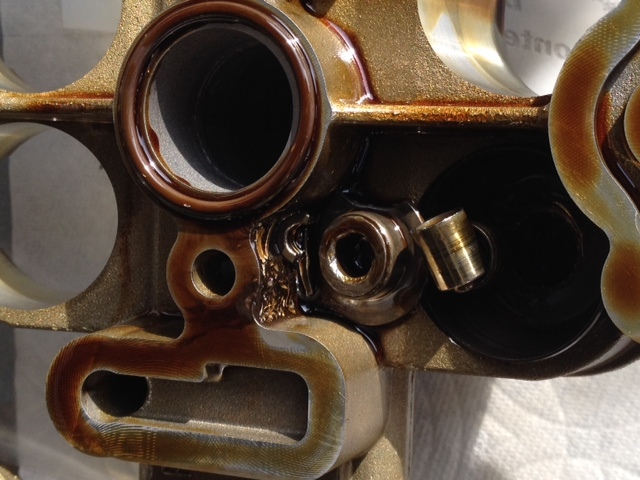 Once off, I could see the valve had contacted the piston, but not bad. So, that's where I'm at. Hope to send the head out this week for rebuild. Any guesses as to what happened? Spring broke first, allowing the clips and retainer to migrate? Once no spring to pull valve back to seat, contact with the piston and then bent? Last edited by Ottomotion; 11-04-2018 at 12:24 PM. Nice work. 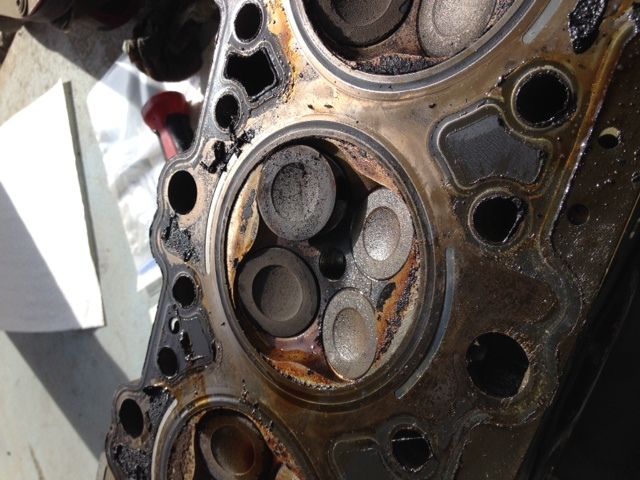 Are you going to leave the piston contact alone and just have a valve job on #5 or this head and put it back together? I don't have anything constructive to offer you, other than I applaud your work and I'm curious and will be following. Please keep us posted. Thanks for the write up. I look forward to following your work. Yes...that's the plan. 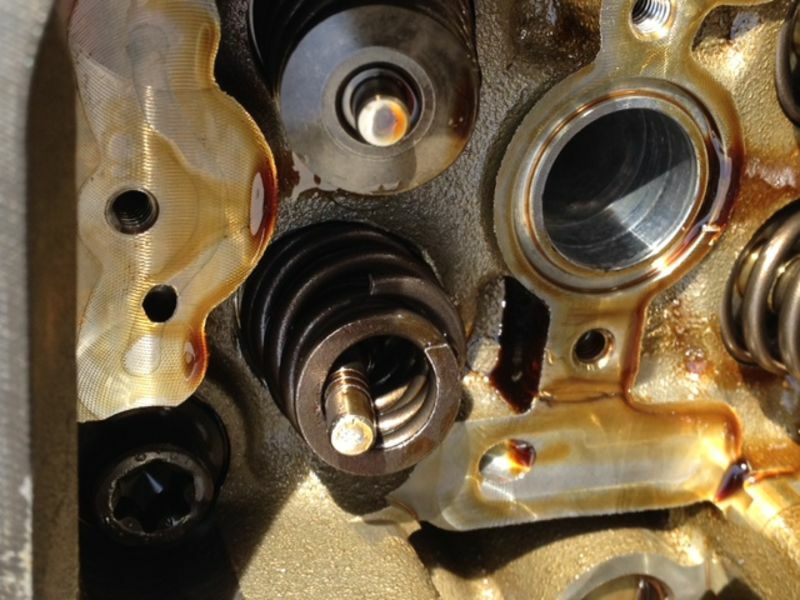 I will emery cloth the shiny spots on the piston to make sure there are no burs that can lead to hot spot detonation. They are not really bad at all. Send the head out for machine. Following this. Looks like a great thread! 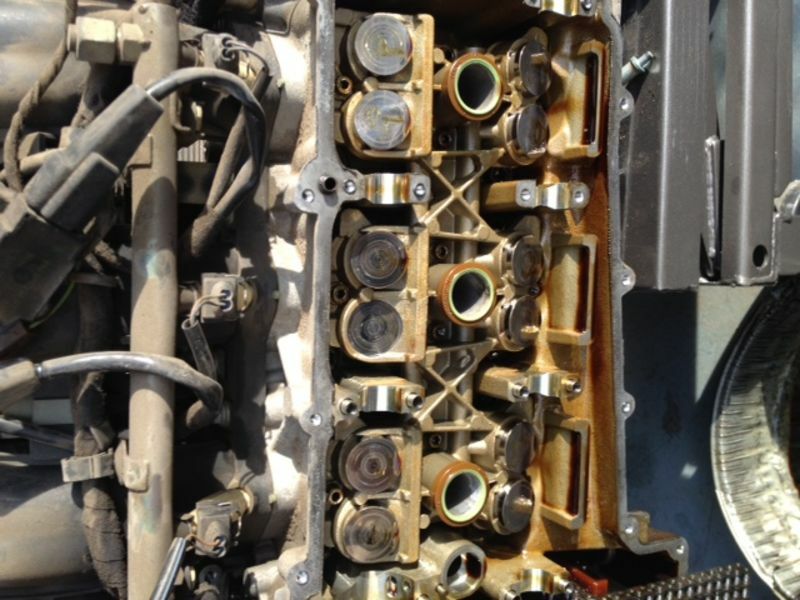 I believe that Len Hoffman (Hoffman Automotive) always replace ALL the valve springs for the same reason, hopefully the valve was not damaged and you can assemble back the engine with only a head job. The lifter guts and valve retainer and keepers did nick the lifter bore. So, I am in need of a good replacement. Not sure if its the same as the 2.7 or if 03-04 3.2 years will innerchange with other years? Anyways, please let me know if you have one. They are on epay, but I would like to deal with a member here if possible. You don't think a light hone and polish would dress that up? Last edited by Ottomotion; 11-05-2018 at 09:26 PM. The "might-as-wells" will always get you. That being said, and considering how far you've torn down (and not to mention the price you picked the car up for), to me it seems the "might-as-wells" are almost no-brainers...and far better than the "wish-I-would-haves". I try to live by "do it once and do it right", with heavy emphasis on "try". Lol. Yeah nothing worse than trying to figure out the “how much time, effort and money” equation. I’m usually of the sort to just do it all while you can. These cars in particular. They aren’t very hard to work on, but things are hard to get to, and that’s half the battle! that thing reminds me of an inline fuel filter (not FI).. It goes into the hole in the head where the valve solenoid goes. The solenoid goes in on top of that. With that being said, I am leaning toward cleaning mine up and using it. Last edited by Ottomotion; 11-08-2018 at 05:51 PM. While waiting for the head to come back from machine, I did a 'might as well as long as its out' change of the motor mount. ....and finally got the head back. All new springs and a good cleaning. Can you spot the new valve? They don't look sideways to me. That kind of thing happens a lot. So the holiday has come and gone and now back to the project. The lifter bore polished up nicely so I will be reusing the old one. Picture #2 shiny side down the triangle part up.